You must include an unsubscribe link and physical address with every email marketing campaign you send. To learn more about the required footer content, read About Campaign Footers. The footer content in Mailchimp is in English by default. To translate your footer content into another language, read Translate Footer Content. When you use merge tags in your footer and elsewhere, it's important to Preview and Test Your Email Campaign before you send. Whether you use the built-in content block that comes with each of our default templates, or a custom HTML template, you can customize the footer like any other part of your campaign. Use merge tags to pull in audience-specific data, or manually add your own details. Our email designer features a drag-and-drop Footer content block, which contains merge tags that automatically populate required and recommended content from your audience data. To learn how to insert and edit the Footer content block, read Use Footer Content Blocks. This sample HTML code contains the required unsubscribe link, physical address, and MonkeyRewards badge, as well as additional details like the audience name, copyright year, Forward to a Friend link, and Update Profile link. If you need some help with your custom code, copy and paste this into your template code and modify it as needed. If you use the sample code, the footer should look something like this. These merge tags pull in important information about your audience from the Required email footer content and elsewhere. This information is typically included in the footer section, but you can use these merge tags anywhere in your campaign. Unsubscribe Link *|UNSUB|* Inserts a link to your unsubscribe form. Use this tag in a hyperlink, in place of a URL. Physical Address *|HTML:LIST_ADDRESS_HTML|* Inserts your physical address and an "Add us to your address book" link that points to the vCard (.vcf) file with your address details. *|LIST:ADDRESS|* Inserts your mailing address as plain text. *|LIST:ADDRESSLINE|* Inserts your mailing address as plain text on a single line. Monkey Rewards (Required for Forever Free Users) *|REWARDS|* Adds the MonkeyRewards badge to your campaign. Contact Details *|LIST:COMPANY|* Inserts your company or organization name set in the Required email footer content for the audience you send to. *|LIST:PHONE|* Inserts your telephone number set in the Required email footer content for the audience you send to. *|LIST:URL|* Inserts the website URL set in the Required email footer content for the audience you send to. *|ABUSE_EMAIL|* Inserts the email address set in the Required email footer content for the audience you send to. vCard *|LIST:ADDRESS_VCARD|* Inserts an "Add us to your address book" link that points to the vCard (.vcf) file with your address details. *|LIST:ADDRESS_VCARD_HREF|* Inserts a text URL that points to your vCard (.vcf) file of your address details. Use this tag in a hyperlink, in place of a URL. Subscriber engagement *|LIST:DESCRIPTION|* Inserts your audience's permission reminder. *|UPDATE_PROFILE|* Inserts a link to the subscriber's update profile page. *|LIST:NAME|* Inserts the name of your audience. *|ABOUT_LIST|* Creates a link to the About your list page. *|LIST:SUBSCRIBE|* Inserts the URL for your audience's hosted signup form. *|EMAIL|* Inserts your subscriber's email address. This can help your subscriber know which address will be removed if they click Unsubscribe. *|FORWARD|* Inserts the URL to your audience's Forward to a Friend form. Other *|CURRENT_YEAR|* Displays the current year. This is great if you include a copyright date in your campaign, because it will update automatically every year. *|LIST:UID|* Inserts your audience's unique ID from your audience's hosted forms. 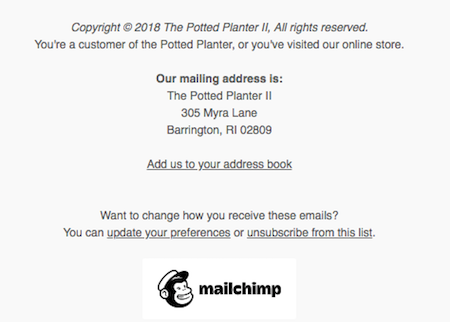 Required footer content appears in default audience information throughout your Mailchimp account, including email footers and your signup forms and response emails. When we use merge tags to add your physical address, permission reminder, and other details, information is pulled from a section in your audience called Required email footer content. You can view or change this information from your audience settings or the campaign builder. To change the required footer content from the audience settings, follow these steps. To change the required footer content from the Campaign Builder, follow these steps. Make your changes in the Edit List Contact Information pop-up modal, and click Save. Our system checks your campaign content to make sure you've included the required merge tags. If certain merge tags are missing, we'll automatically add a default footer that contains the merge tags to the bottom of your campaign, which will look something like this. If an extra footer was added to your campaign, here are a few possible reasons. The unsubscribe merge tag is missing. You're required by law and Mailchimp's Terms to include the *|UNSUB|* merge tag in all campaigns. Write an unsubscribe message, like "Unsubscribe from this list," and use the *|UNSUB|* tag in a hyperlink, in place of a URL. The MonkeyRewards badge is missing. If you're on the Forever Free Plan, your campaigns must include the *|REWARDS|* merge tag. To learn how to change the look of your MonkeyRewards badge, read about how to Set the Default Badge. Microsoft Word added excess code to your HTML. We don't recommend you use Microsoft Word or any other rich text editor to create your content. These programs weren't made to convert to HTML and can add excess code that interferes with our system's ability to recognize merge tags. If you must copy and paste content from a rich text editor, first use the Clear Styles button in the editor toolbar to remove the extra HTML code. You'll then need to re-apply styles to your text in the Campaign Builder. An HTML tag or merge tag was left open. If any tag is left open in a custom HTML template, the system may not see your *|UNSUB|* merge tag. Review your code and be sure that all tags, including both HTML and merge tags, are closed. The email campaign footer includes required content, like sender information and links, at the bottom of emails. Get tips for editing your campaign footer.